All of this seaglass was collected on beaches in Prince Edward Island - after finding the bottom of an old Javex bottle, I was on the lookout for the real thing - found it for only $2. This glass was collected in a 2 week period in September - love it! There is nothing more relaxing than walking the beaches of Prince Edward Island in search of that better piece of seaglass! Love it! "Prince Edward Island is located in the Gulf of St. Lawrence. The island's landscape is pastoral. Rolling hills, woods, reddish white sand beaches, ocean coves and the famous red soil have given Prince Edward Island a reputation as a province of outstanding natural beauty. "Author Lucy Maud Montgomery drew inspiration from the land during the late Victorian Era for the setting of her classic novel Anne of Green Gables. Today, many of the same qualities that Montgomery and others found in the island are enjoyed by tourists who visit year-round. "The coastline consists of a combination of long beaches, dunes, red sandstone cliffs, salt water marshes and numerous bays and harbours. The beaches, dunes and sandstone cliffs consist of sedimentary rock and other material." 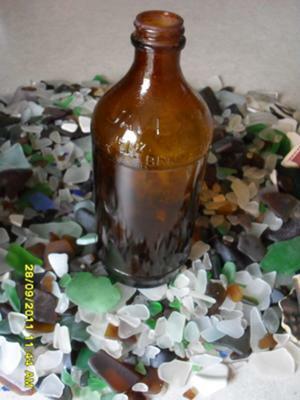 And, we might add, a great place for sea glass and another destination to add to your sea glass travel agenda!